Magazinzoo.com Reviews How slot machines works? Payment Line: A line of payment is each one of the lines that have a prize associated in case they contain a combination of symbols included in the prize table. Payment Lines Indicator: With the payment line indicators you can select the number of payment lines that you want to activate in each run. In the online slots you have to click on the indicator of the payment lines that you want to activate. For example, if you click on the “3” indicator, 3 payment lines will be activated, the patterns of those lines will be displayed at the moment you click and the indicator will stay lit to show how many payment lines are selected. The selection of the payment lines can be changed in each run, if it is not changed the selection of the previous run is maintained. Number of selected pay lines: The “Bets Lines” button is used to modify the number of active pay lines in the roll, this number can also be changed in the online slots using the payline indicators that are on the right and left of the rollers. Balance: This section shows the balance that is available to play at each moment, the balance changes on each play depending on whether it is won or lost. Bet Level: With the bet level button you can modify the number of credits that are bet per line in each roll. Currency value: With the button “Currency value” you can change the number of credits used in each game. Maximum Bet: Pressing the button “Maximum Bet” will play a roll playing the highest level of bet that allows the machine and activate all the payment lines of the machine. These two conditions, higher bet level and all active pay lines, will be fixed for the next roll, if you want to change you will have to use the buttons “Bet Level” and “Bet Lines”. When playing in the “Maximum bet” mode, the value of the coins is not changed, the value of the coin is only modified using the button assigned to it. 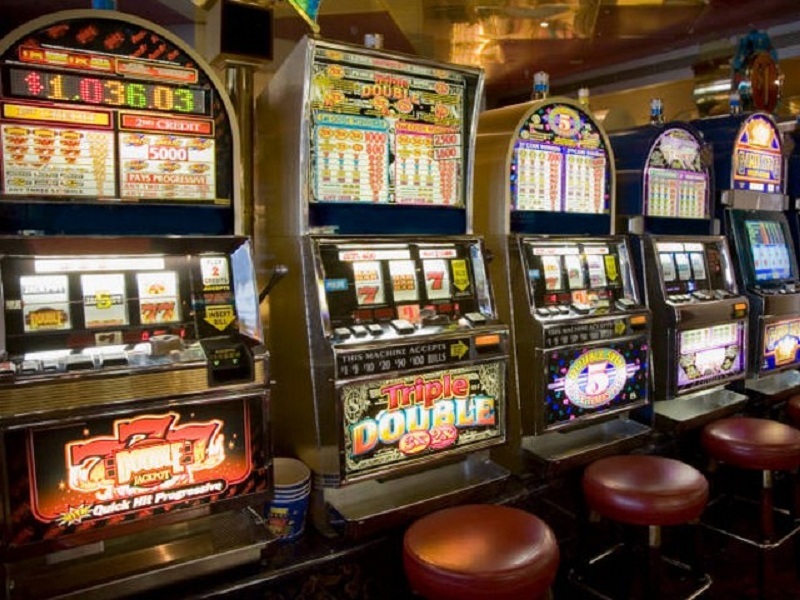 In the slot machines that have jackpots it is necessary to play the maximum bet to qualify for the jackpot, this is explained in the slot machines with jackpots. Play: The play button is the one that activates the rollers and rotates them. In some cases the name of the buttons is in English. In the following table of vocabulary of the slot machines are collected the English words that are often used in online slot machines or those found in casinos. All the slot machines have a table of prizes that explains the combinations of symbols that have a prize in the game. In the slots of the bars or land-based casinos the prizes table appears next to or above the reels, in the online slots you can access the prizes table by clicking on the “Paytable” button (paytable). In the table of prizes the prizes for each symbol are detailed. Next to each symbol, the number of credits that are won by getting a certain number of consecutive occurrences of the symbol from left to right is detailed. For example, in the table of payments of the image it is shown that if 3 consecutive houses are obtained in any of the active payment lines, 50 credits of profit will be obtained, if 4 are obtained, 120 credits of profit will be obtained and if 5 credits are obtained. 600 credits will have been won. Wild (wild): this symbol can substitute any other symbol, with the exception of the scatter (multiplier) and the bonus symbol, in order to achieve a winning combination. Multiplier (Scatter): if this symbol is obtained in any of the active payment lines as many times as indicated in the payment table, the multiplier associated to the number of occurrences that we have obtained at the total gain of the roll will be applied. In the example payment table, the multiplier is the symbol of “posy puppy”, if 2 “posy dogs” are obtained in any of the active payment lines of the roll we will obtain as profit the total gain of the game (sum of all the winning lines) multiplied by 2, if we get 3 puppies we will have won the win multiplied by 4 plus 10 free spins. Bonus: if you get a certain number of bonus symbols you will start the bonus game of the slot, these bonuses give extra prizes or free spins. In online slots, the prizes table also collects information about the patterns of the pay lines. The pattern of payment lines illustrates the patterns of all the payment lines that are available in the slot. In online slot machines, the table of prizes is shown in a window other than the game, after consulting the table of prizes you will have to click on the button “return to the game” to return to the game of the slot machine and continue with the rolls . The next thing is to learn how to play the slots. After having clear the elements of a slot machine it is time to start knowing how to use them and to know some useful tips for when it comes time to play.